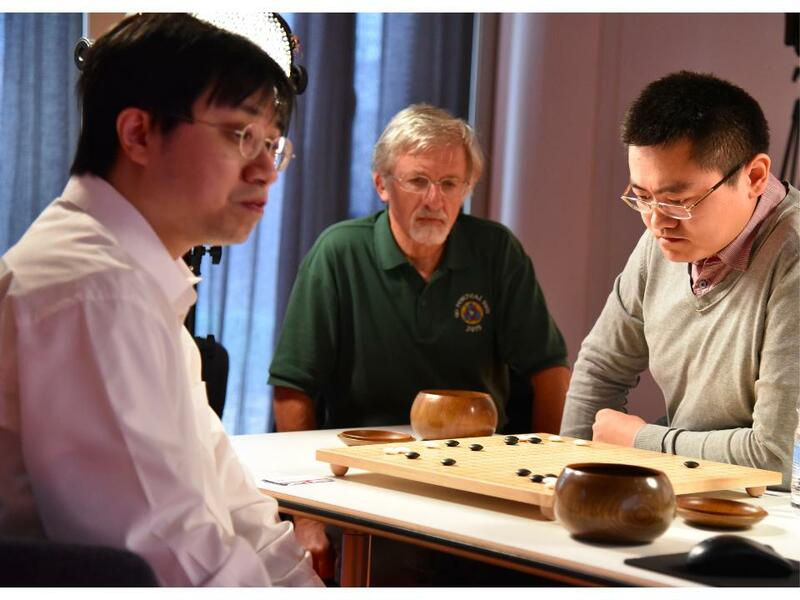 A computer program (AlphaGo) developed by Google DeepMind to play the Oriental game of Go has beaten the three-times European Go Champion and Chinese professional Fan Hui (shown on the right in the photo below, courtesy of Google DeepMind) by a clean sweep in a 5-game match. This is the first time that a Go-professional has lost such a match and signifies a major step forward in one of the great challenges in the development of artificial intelligence - that of game-playing. These findings were reported in a peer-reviewed study published in the scientific journal Nature: Silver D. et al. Mastering the game of Go with deep neural networks and tree search. Volume 529, issue 7587, pp 484-489. We issued a Press Release about this: Major Step Forward in Artificial Intelligence. More can be seen here. A full article about the match written by Toby Manning (shown centre in the picture) will be published in the next (end January) issue of the British Go Journal. A summary of this is available here. The full article as part of the insert is here. "Following the Chess match between Garry Kasparov and IBM's Deep Blue in 1996 the goal of some Artificial Intelligence researchers to beat the top human Go players was an outstanding challenge, perhaps the most difficult one in the realm of games. It's always been acknowledged that the higher branching factor in Go compared to Chess and the higher number of moves in a game made programming Go an order of magnitude more difficult. On reviewing the games against Fan Hui I was very impressed by AlphaGo's strength and actually found it difficult to decide which side was the computer, when I had no prior knowledge. Before this match the best computer programs were not as good as the top amateur players and I was still expecting that it would be at least 5-10 years before a program would be able to beat the top human players; now it looks like this may be imminent. The proposed Challenge against Lee Sedol may well be that day. One significant aspect of this match was that AlphaGo analysed orders of magnitude fewer positions than Deep Blue did. Deep Blue also had a handcrafted evaluation function, which AlphaGo does not. These indicate the general improvements in AI techniques that Google DeepMind have achieved. This surely means that the technology behind it will be really useful in other knowledge domains." Finally, how does this affect humans playing Go? Well, I think not very much. The loss by Kasparov against Big Blue in 1996 didn’t really affect Chess, although there are programs that help Chess players with databases of games and analysis, and I think the same will apply to Go. "This is the first time that a computer has challenged a top human pro in an even game, and I am privileged to be the one to play it. Regardless of the result, it will be a meaningful event in Baduk (Go) history. I have heard that Google DeepMind's AI is surprisingly strong and getting stronger, but I am confident that I can win at least this time." "We welcome the development of computer AI with Google DeepMind and its challenge to Lee Sedol. It will be an exciting event for all Baduk players around the world. About the result, I think the computer may win one or two games because Lee Sedol hasn't played any strong computer AI before, but I doubt that the computer can win the overall match." We're pleased to say that Hajin Lee, a Korean professional, has contributed to the comments in Toby's article and that some of our members were part of the Google DeepMind team, which is based in London. We're also happy to say that Google DeepMind are providing some sponsorship to us in recognition of our part in organising this match and their interest in growing the Go community. Toby will feature in a video that Nature are producing and Jon in a number of press articles about the event as well as some other members of the Association. 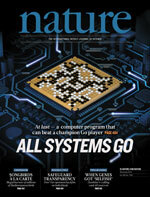 Nature have published a main news story with an excellent video Google AI algorithm masters ancient game of Go and a separate one Go players react to computer defeat. Later in 2016 AlphaGo played Lee Sedol see our report of the match. See our Mentions in the Media page for a full list of stories/articles, which appeared in many national newspapers, magazines, on radio and on television. Last updated Tue Aug 01 2017. If you have any comments, please email the webmaster on web-master AT britgo DOT org.